This crispy truck still runs. Wildfires are raging through California right now, claiming countless homes, communities, and, sadly, lives. The intense and dangerous situation has forced some to take drastic measures for survival in the chaos. Adventist Health nurse Allyn Pierce, who manages the ICU, used his Toyota Tundra to help evacuate patients stuck at the hospital. Jack Nicas of The New York Times discovered the story. Apparently, Pierce and his colleagues helped evacuate the hospital. On their way out in Pierce’s truck, they found their path blocked by a burning truck. A bulldozer came to the rescue, knocking the burning vehicle out of the way. 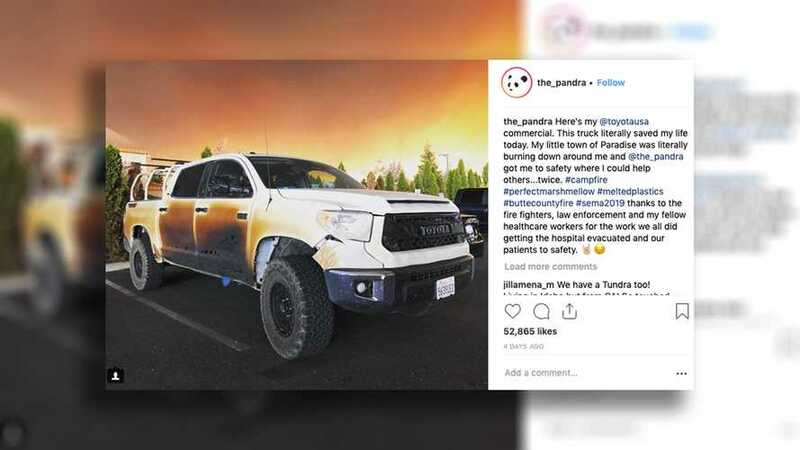 However, instead of driving to safety, Pierce turned the truck around and headed back to the hospital where he discovered injured Paradise residents had gathered there. They were looking for help. Police, nurses, doctors, paramedics, and others broke into the hospital to retrieve medical supplies to help the injured residents. Once the hospital caught fire, staff moved injured residents about 100 yards away to the hospital’s helipad, setting up a makeshift triage area. Eventually, a path to safety was cleared, and everyone made it out safely. The fires in California are tragic. People are uprooted, and entire lives are being wiped away. So far, more than 40 have died in the Camp Fire alone near Paradise, California. It’s the fire that almost trapped Pierce, his colleagues, and injured residents.